Handheld devices - please view horizontally - our belts and buckles look best that way. Sterling Silver Adirondack II "Trout"
This one-of-a-kind Adirondack II "Trout" ranger belt buckle set is a unique modification of our popular 2006 annual edition buckle. 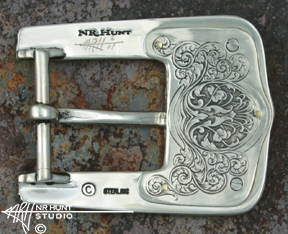 The buckle's top and bottom plates, as well as the decorative back plate were re-worked with new designs and cast in solid sterling silver from Neil's original hand engraved masters using the lost wax technique. The keeper and tip are hand engraved, as is the leaf-work on the sides (tangs) of the buckle. The belt buckle is assembled from 4 pieces of silver and 1 piece of mokume-gane with a trout on it. The two raised silver scroll-work sections are attached to the front of the silver buckle with tiny jewelry screws, as is the silver backplate. The mokume-gane is sandwiched between the body of the buckle and the backplate, while on the keeper and tip it is soldered onto the silver. Mokume-gane (Japanese for "wood grained metals") is a type of Japanese married metal made from diffusion bonded laminates often used in decorating swords, in this case consisting of sterling silver, copper, shibuichi, and shakudo. It is usually worked from the back to produce valleys and ridges on the front, which are filed and sanded to reveal a unique design. A specially formulated chemical treatment leaves a rich patina, highlighting the character of the metal's design. The waves and movements of these particular pieces of mokume-gane inspired Neil to create this truly unique and appealing belt buckle set. The Adirondack II "Trout" belt buckle has a 1" (25mm) wide opening and overall measurements (of the buckle) are 1 15/16" high, and 2 1/2" long. Order securely online, or by phone or mail. Copyright © 1997-2019 NR Hunt Studio. All rights reserved.